On the evening of the 8th I was down at Lytchett Bay helping to set up the mist nets at Lytchett Bay for the following morning’s ringing. One net ride known as ‘Riverside’ is just that, it ends on the bank of the River Sherford. whilst trying to place the pole in the bank, I slipped and plunged head first into the river. The tide was in and the Sherford was sufficiently deep so that I couldn’t touch the bottom; to make matters worse, the bank by the net ride was undercut and I couldn’t get a footing to clamber out. Fortunately Terry Elborne and Paul Morton were setting up nearby and hearing the splash came to my rescue. I put a brave face on it and even asked them to use my camera to photograph the scene, then I realised that my camera was still on my belt and was completely ruined. This was the camera I had bought less than a week ago to replace the one I had lost in PNG and to make matters worse my phone was in my pocket. Fortunately my binoculars survived the immersion without damage. It goes without saying the other members of the ringing group found the incident hilarious. There have been a number of requests to rename the net ride from ‘Riverside’ to ‘Tom Daley’, ‘Flipper’ or ‘Gryllo’s Swim’. Requests for reinactments, underwater photographs etc abounded. A final twist to this tale was when I contacted the insurers to claim for the phone. When I reported the details they asked if it was best to ring me back on the landline. I pointed out that I could hardly be contacted on my mobile! We ringed at Lytchett Bay on the mornings of the 9th and 10th. Given the dreadful weather of this spring and summer, it is hardly surprising that numbers trapped are less than half those at this time next year. One particularly notable feature of this autumn is the greatly raised proportion of adult birds present. This reflects that there has been good adult survival in spite of the weather but very poor reproductive success. Also many of the young birds show pronounced growth bars on their tails. This is produced when birds suffer a severe depletion in nutrients for a few days whilst growing the tails feathers and shows most clearly in young birds as all the tail feathers are grown simultaneously. I will post some photos of this phenomena when I finally get a pocket camera again. 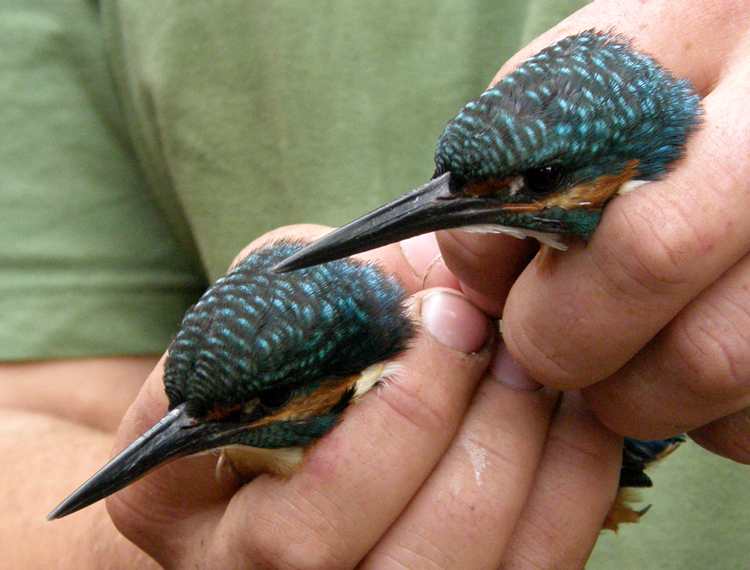 I have seen four Kingfishers in the hand over the last few days, three at Lytchett and one in north Dorset. After the ringing on Saturday 11th, Margaret and I went down to the beach, unfortunately the hot conditions of the last two days had been tempered by a stiff easterly breeze. I considered a second swim in as many days, but the sea was so cold that I only went in ankle-deep, although Margaret was a bit more adventurous. We didn’t stay long as I had yet another outing to fit in. With Paul Harvey down from Shetland, Ian Alexander suggested that the three of us go and stay at Trevor Squire’s private reserve in north Dorset. Trevor trained me to ring in the 70s and early 80s and is one of the most experienced ringers in the country. After a pub meal we stayed overnight in his caravan, although we didn’t get much sleep, each person accusing the others of snoring all night. We trapped over 70 birds, mainly migrants, not bad for an inland site, indeed an inland site that was just a grassy field a few years ago. I was back home by lunchtime on Sunday 12 and needed a well earned rest after a very busy few days. L-R Ian Alexander, me, Trevor Squire and Paul Harvey photographed in December 2011. 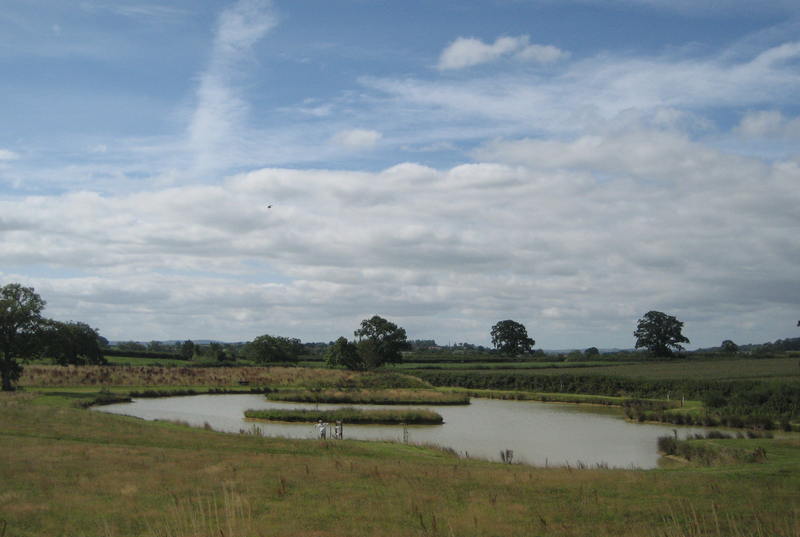 Trevor’s reserve photographed last summer, the vegetation has grown up considerably since then.